Mom was a great lover of ice cream. In the Summer, it was she, far more often than the 3 of us kids, who suggested going out for ice cream after dinner. Dad rarely, if ever, refused her and, so, we’d pile into the car and off we went. Many years later, she and I would be in the car, returning to her home, when she would mention ice cream. The next thing I knew, we’d be standing at some counter waiting for our single scoop cones. Well, Mom’s birthday — as well as that of her Mother — was August 15th; Uncle’s birthday, Zia’s husband, was August 11th; the birthday of my Friend the kitchens’ Taste Tester was on the 7th; and my Friend the Entertainer’s birthday is August 20th — but wait, there’s more. In the Children’s Division, my Grand-Nephew’s birthday is the 1st and the Oldest of the Boys Upstairs has a birthday on the 18th. Well, with so many birthdays to honor, I’m going to post ice cream recipes for the next 3 Fridays of this, their “birthday month.” (My Friend the Entertainer believes that one’s birthday should be celebrated the entire month.) And whether you choose to make any of these 3 ice creams, make sure that on at least one of August’s warm nights, you get yourself a single scoop cone. You’ll soon discover what Mom knew all along: it’s a great way to end a day. Today’s recipe, pistachio ice cream, is pretty much the same one that Mom gave to me in a recipe book years ago. It’s not a complicated recipe and there’s no custard to make. Still, there are a couple of things to consider. First, and most importantly, the recipe calls for 1 raw egg. Now, I am certainly not advocating the use of plain, raw eggs in this, or any, recipe. When a recipe calls for raw egg, I use eggs with pasteurized shells. You can find them in the egg case at your grocery and using them will eliminate any worry you might have when serving raw egg. Yes, they may cost more but the peace of mind is well worth it. With the “egg question” out-of-the-way, all that’s left is how to deal with the pistachio nuts. First off, I use roasted, unsalted nuts that I shell myself. It is much easier to remove the “paper” off of the nuts if you shell them yourself, and the less paper, the greener your ice cream. Still, even with every bit of paper removed, your pistachio ice cream will not be as green as store-bought. For that, you’ll need to add a few drops of food coloring. Whether to use food coloring is a decision for you to make. Secondly, while half of the pistachio nuts are ground in the blender, I freeze the other half in my freezer, based upon a comment by my Trusty Traveling Companion. Although he likes chopped pistachio nuts in his ice cream, he doesn’t like that they’re often a touch on the soggy side. By adding them to the ice cream already frozen, the problem is avoided. Place half of the pistachio nuts, the egg, and half & half into a blender and “Chop” until nuts are fully ground. Add everything but the reserved pistachio nuts to the blender and “Stir” until well-blended. When completed, remove the ice cream from the canister for serving or transfer to a sealable container and placed in the freezer. There are plenty of pistachio ice cream recipes on the internet offering far too many variations to list here. One particularly interesting method can be found on the Brown Eyed Baker’s website. In addition to adding chopped nuts to the cream mixture, he begins by steeping some of the pistachios in milk, extracting as much flavor as possible from the nuts. 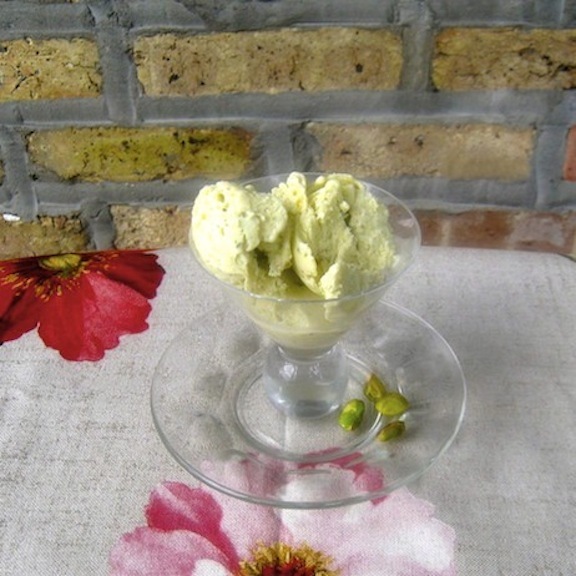 If you’re googling pistachio ice cream recipes, be sure to check his out. Your machine may not recommend adding nuts to the cream while the machine is running. If that’s the case, process the ice cream per the manufacturer’s instructions. When finished, add the nuts to the semi-frozen cream, stir to fully combine, and either garnish & serve it or transfer it to a sealable container and place in the freezer. This entry was posted in Family Recipes, Sweets (Dolci), Vegetarian and tagged Dolci, Food, Ice Cream, Italian, Nuts, Recipes by ChgoJohn. Bookmark the permalink. This looks so good – pistachio is a favorite! Also love your presentation! I, too, love pistachio and I think it’s because it’s not as common as it once was. It seems more “special” than most other flavors. Great tip on the eggs. We use raw in our Caesar salad and tiramisu, so I may have to seek those out. Three ice cream recipes = three times for me to be tempted to get a maker. I noticed and that’s good advice! I’m so impressed with all your talents in the kitchen! My mother too loved her ice cream and my father, her and I would get in the car for a trip to get ice cream! I remember those days so well; it was a real treat to get ice cream! You brought a smile to my face reading this memory of yours. I’ve commented on this many times, I purchased an ice cream maker in January but have yet to try it out! Just don’t know why I’m stuck on getting going! 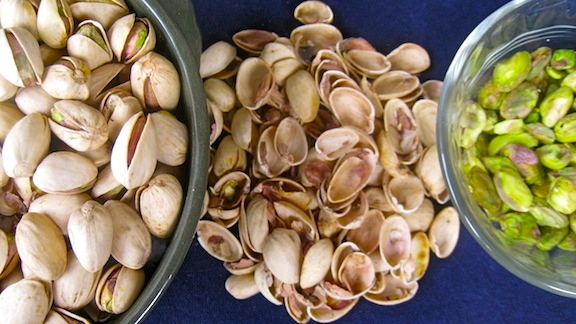 Pistachios are a real favorite of mine, I can only imagine how good this must taste homemade! Great photo too!! It’s a funny thing but, even to this day, if I see a Dairy Queen sign lit up at night, I immediately remember those family “ice cream runs.” Such a treat! BUT, tell me, how do you do that, keep an ice cream machine for 7 months without using it? It is time, Linda, for you to help your machine fulfill its destiny. It is time to unleash the ice cream maker! Happy Brithday to all your loved ones this month! Were any of the ladies called Maria Assunta becuase of the day they were born? We had quite a few in our family. Fantastic recipe and great tip about the eggs. We´re lucky to have our own flock of hens, so my egg can be in my kitchen as soon as it´s laid, but for those not in this lucky position, it´s a good thing to know. “Maria Assunta,” such a pretty name! My family didn’t follow that tradition, though my brother, the first-born, was named after our paternal Grandfather and my sister, the first-born daughter, was named after our maternal Grandmother. Being 2nd born, I think they got my name by drawing it out of a hat. I guess I’m lucky it isn’t “Stetson” or “Size 7 3/4”. I envy you and your fresh eggs. Your fresh pasta, cakes, and omelets must be fantastic! I love when that happens! I hope you like the pistachio recipe, Tanya. It got good reviews from my tasters. Good luck! Oh, yummy! Not a pistachio fan, so I’m eagerly awaiting next Friday’s goodies! Homemade Icecream is always linked with Church Socials in my memory. Someone back home used to make a Butterfinger icecream every summer, and you had to be close to the front of the line if you wanted to get a scoop…Mmmmm, what a tasty memory. Unfortunately, I am not related to the Icecream Maven, nor do I remember who it was…maybe someday I’ll find out. It’s funny but I can keep store-bought ice cream in my freezer for weeks, even months, without ever touching it. Home-made ice cream, however, is a completely different story. I love to make it, to try out different recipes, and I have little or no self-control when it comes to eating it. I give much of it away, ASAP, or I’ll make a meal out of it. And Butterfinger ice cream sounds absolutely incredible! I am so glad I don’t have that recipe — yet. Yummy! I love pistachios, and in ice cream sounds wonderful. I really need to get one of the ice cream makers. The ice cream sound wonderful! Oh, yes, do get one. You won’t be disappointed. There just isn’t any comparison between home-made and store-bought ice cream. How very special that you will be honouring so many wonderful birthdays this month. Pistachios are my hubby’s absolute favourite so this ice cream would be top of his list of favourites. Your husband’s love of pistachios is echoed among a few of my friends, all of whom love this recipe for pistachio ice cream. Mom would be happy to see her recipe so well-received. And you enjoy your weekend, too, Mandy. Pistachios and ice cream. Hard to imagine thing going wrong with that. 🙂 Now if only I had an ice cream maker…. Pistachio was just the opening volley. Wait till next week … and the week after that. By the end of the month, you’re gonna be wishing you bought that machine. You, too, have a great weekend! Pistachio ice cream is one of my favorites! I need to buy and ice cream maker – gelatiera – -after reading your post. I do enjoy your blog very much (so does my mom!) and so I added you to my blogroll. I love pistachio ice-cream! Yours looks fantastic! I’m always a bit nervous to make ice-cream with egg in it! My taste-testers all agree that this is a great recipe. And I agree totally with you about using raw egg. That’s why I use the eggs with pasteurized shells. The hyperlink within the blog entry will take you to an article written by a professor at Auburn Univ. I found it very reassuring and now I won’t use a raw egg unless its shell has been pasteurized. Looks great! I live in Greece and unfortunately we don’t have pasteurised eggs available. I’ve seen a couple of websites with instructions on how to do it yourself, so I might give it a go and hope for the best! Wouldn’t try it on anyone in a high risk group, as you mention above. I also really want to try your peach ice cream! Thanks for the recipes! Thank you for stopping by and taking the time to leave a comment. We’re fortunate that the pasteurized eggs are readily available. You never really know the health issues of everyone seated at your table. Why take a chance? I didn’t know that there were instructions for “cleaning” the eggs online. I’m going to google it, too. Thanks for the heads-up. Love pistachios! This looks delicious; as always! Best pistachio ice cream I ever had was in Venice. And I’ve tried a few. It wasn’t overly sweet, and had a nutty, slightly salty and very creamy taste. That does sound like a good one. No matter where I am in Italy, when I find a good gelateria, I look no further and will return to that place for as long as I’m in the area. 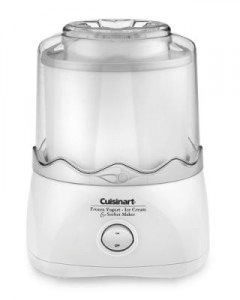 Is your ice cream maker the 2 litre Cuisinart ICE30? I’d like to get one! Jolly good idea, I am a bit disappointed I couldn’t make ice cream back-to-back this morning, and the freezer bowl takes AGES to re-freeze!